The internet is full of tips about how to visit Stockholm on a budget, and no wonder. Scandinavia is seriously expensive. That’s why we waited to visit this area of the world, until we could allow ourselves to be a little less restrictive with our budget. Because really what’s the point of visiting someplace if you can’t really afford to enjoy it? And though it’s true that we’re in a more relaxed financial position today, we’ve certainly done our share of budget traveling, from sleeping in decrepit $5 beach huts in Thailand, to eating at the cheapest roadside stalls in India. In fact, out of the 54 countries I’ve visited, most of them have been visited on a budget. For our around the world trip, our goal was to spend just $50 per day each. We weren’t always successful, but we definitely tried. Point being, I think we understand a little bit about the ins and outs of budget travel. So even though we weren’t backpacking Stockholm, I couldn’t help but assess the city to see if it was actually possible to visit the city on a backpacker budget. On his site, Nomadic Matt managed to make $100 stretch over 5 days in Stockholm by couch surfing, walking everywhere, and cooking all of his own food. So clearly, it IS possible to be in Stockholm for some period of time on a very limited budget, but that’s not what I’m talking about here. Because to me, you haven’t legitimately been to a country or city, unless you’re actively visiting that city. If you don’t eat any of the local food, or see any of the sights that make the city famous (touristy or not), what’s the point of being there in the first place? Just to pin a dot on a map? So I’m gonna go out on a limb and say that you can’t really visit Stockholm on a backpacker budget, which I’m saying is around $50/day. Here’s why. This is the chunk that’ll eat up most of your budget. Yes, you can couch-surf. And yes, it’s completely free and a wonderful way to get a more local experience of a destination. But I’d say that most backpackers still check themselves into a hostel. There’s only so many couch-surfing spots available, and unless you’re a serial couch-surfer with a lot of positive reviews, it’s pretty difficult to score yourself one of these amazing free beds. Which leaves the next most budget-friendly option: the hostel. The cheapest bed in a decently rated hostel in Stockholm costs around $20 per night, and that’s in a 14 bed mixed dorm. Oh, but did I mention that this price doesn’t include sheets or towels? Unless you’re carting sheets and towels around (and I haven’t met many backpackers in recent years that do), count on an additional $15 per night to rent them. Stockholm is a very walkable city, and on a backpacker budget, walking is without a doubt the best option. It’s free! However, you still need to get from the airport to the city, and that distance is most definitely NOT walkable. The cheapest, and not surprisingly lengthiest option, involves a combination of local bus and commuter train, and costs 60 krona each way (about $10). There are budget eating options in Stockholm, but they’re not Swedish. They’re falafels, pizza or donairs. And as far as I’m concerned, you haven’t experienced a culture until you’ve tasted their food, so this budget requires at least 1 authentic Swedish meal. The most budget-friendly way to accomplish this, is by taking advantage of a dagens or set meal at lunch time. In non-touristy areas (read NOT Gamla Stan), you can get a great menu of soup, pan fried herring, or Swedish meatballs, plus a drink for around 75 krona (about $12). I’m afraid that when you’re backpacking Stockholm, entertainment has to be limited to free things. Fortunately, there are a few free museums in Stockholm, free walking tours (they ask for a tip, but it’s not required to participate), and beautiful outdoor areas to take advantage of. Exploring Gamla Stan’s narrow alleyways and corridors could easily take up an afternoon. So how much did our budget day and night backpacking Stockholm cost? $72. $22 over our $50 per day backpacker budget. Yeah, it’s not crazily over, but we sure didn’t get to do much. We weren’t able to visit some of the premier tourist attractions, like Fotografiska or the Vasa Museum ($20 entrance fee), or partake in a fika ($10), because adding these small indulgences would’ve broken the budget. There’s a reason why you don’t see too many backpackers in Scandinavia. Mostly people chalk it up to the expense, but now that I’ve traveled there, I don’t think it’s just because of the cost. Stockholm was a very, very pretty city. Maybe one of the prettiest cities I’ve seen. But was it enough to justify the high cost? I don’t think so. There are plenty of equally beautiful and honestly, more interesting cities in Europe that cost much, much less to visit. What do you think? Would it be worth it to you to visit an expensive city like Stockholm on a backpacker’s budget? Even if it meant you couldn’t really see and do everything you wanted to do? Wow! Great story on an expensive city! I too have stayed in Stockholm, it was a 16hr transit so stayed at the Jumbo Hostel at Arlanda Airport which was great for a plane spotter but I missed out on all the other attractions the city had. I did go McDonalds for dinner at the airport terminal and had a basic meal for about $20! Stockholm + Airport markups were ridiculous! wow, $15/night for towel service is insane! that’s how they get you. I think you can travel around Germany much more cheaply. When I was there for a brief two-week stint, I was pleasantly surprised by how seemingly reasonable most things were, with the exception of a bright red blazer I decided to buy… ha! Stockholm is a beautiful city. Travellers on a budget should check out sites like Couchsurfing and/or Hospitality Club. A fascinating insight into a city that I have always fancied visiting. It really is very beautiful, but just so expensive. Summer would be better I think, cuz you could really take advantage of all the daylight and the Stockholm Card. Just want to mention that McDonalds in Scandinavia is hideously expensive compared to other places. If you think you are getting a cheap meal by eating at Macca’s -then don’t. There are way better and cheaper options at hot dog stands or bakeries. I had heard that, so we avoided McDs while we were there. We don’t eat it much anyways, so it wasn’t hard…but yes, the stands on the street were much more reasonably priced, and I even thought the Dagens sets were very affordable. A lot of quality food at a good price. 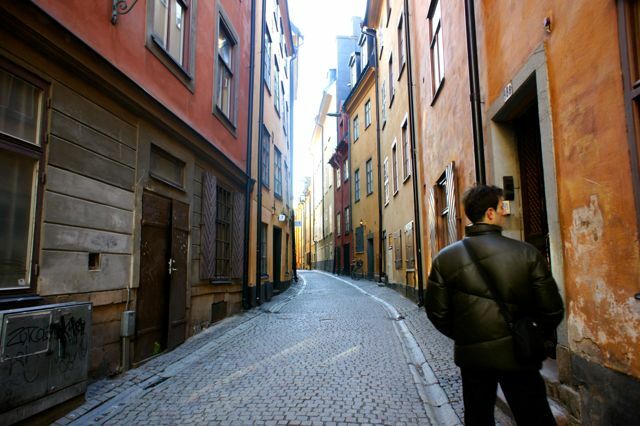 I was thinking about backpacking in Stockholm but will reconsider based on your post – I always travel on a budget (living alone in NYC makes it hard to save) and after weighing the pros and cons you pointed out, I’m going to consider other cities. SEA is definitely an option as well. Thanks for the insights! Interesting. I haven’t yet been to Stockholm but I certainly found Östersund to be very expensive although definitely cheaper than Trondheim in Norway. We’ve been living in Trondheim for nearly 2 months and have not done anything ‘touristic’ (including eating out) for a few reasons, one is obviously the cost, the second is that we are here for 2 years and we are saving that for when we have visitors but also because we easily fill our time with free activities, like picking berries or mushrooms in the forest, hiking in the mountains next to the city and the many free cultural activities in the city throughout summer and early autumn. In the summer we were perplexed to see tourists spilling from cruise ships into Trondheim and filling the footpath cafes and bars where one needs to sell a kidney to buy a drink. I travel a lot and increasingly I’m disinterested in sightseeing and being a tourist. Connecting with people is my aim but that’s not overly easy to achieve! I’ve been very fortunate to be invited into homes in Saudi, Italy, Bahrain, Norway, Kuwait, England, Thailand, Argentina, USA, Indonesia, Poland for meals and those have been my best travelling experiences but the least reliable! I found all the places we visited in Scandinavia to be very expensive! There are a lot of free things to do, for certain, but when you’re only visiting for a few weeks, even the cost of accommodation can be intimidating. It’s funny you mention the tourists spilling out of cruise ships in Trondheim. We experienced a similar thing when we were in Tallinn. Boatloads of Finns making the journey over, simply to drink…though in this case, it made more sense since alcohol was much cheaper in Estonia. Yes I completely agree and I can’t imagine being a tourist in Scandinavia. In fact, I often encounter Scandinavians travelling elsewhere and I can understand why! Now that I’m living in Norway I can also understand going on a drinking holiday! We have booked trips to France, Latvia, Poland and Germany between now and Christmas and one of our main focusses will be on eating out and having the occasional drink, both of which we daren’t do here. What a great idea to stay on a local island in the Maldives! Totally agree! We went to a resort island on a day trip and it was SO. BORING. Beautiful, but boring. We stayed on Maafushi, but definitely wanna go back and explore other islands. How was Dhiffushi? I plan on doing just this so thank you for all the tips! I will surely write up my experience.